TGAH was a series that was shot mainly on location as opposed to being filmed on sets and the studio backlot. Although there were some sets (Hinkley home interior, FBI offices, Maxwell's apt.) 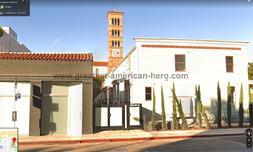 located in a Culver City warehouse that was converted into a soundstage, the series shot for the most part on the streets and buildings throughout the Los Angeles area and other parts of California. Thoughout the series, some areas names and locations were known to me because of their continued use over and over in television and film production. 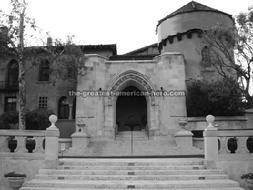 For example, places such as Sisters of The Immaculate Heart, and Bronson Canyon have been used for years and I was aware of those among a few others even back during the series original run. However some other locations could have been anywhere, and it wasn't until the various map options on the internet and the INCREDIBLE detective work of one of my forum members MST3Claye did many of the actual shooting locations come to light. In this section I will showcase many of the areas used during the location filming of TGAH. If interested in where the production shot with more detail please join the discussion on this sites forum. Once registered a section called Real-Life Locations will become accessable, and you will find many pages detaling the detective work used to track down and confirm many areas the company used. Here's the diner where Ralph and his student's encounter Bill Maxwell. It's been known as Cadillac Jack's Cafe, and is located in Sun Valley, CA. I have no idea if the business is still open, it appears in the current photo that it's not. This is the Hinkley home featured in the pilot and barely seen at all. 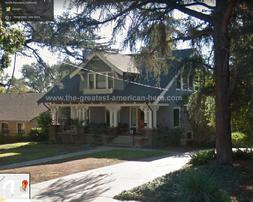 Its real location is in Pasadena, CA. 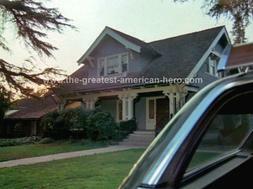 The screengrab from the pilot movie is the left photo, while on the right is the house at it currently appears. It's unknown why the company chose to go with another house, when the series went into production. 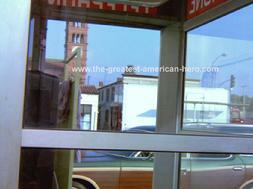 Here's the phone booth scene from the pilot, also shot in Pasadena. 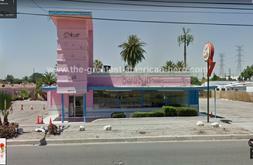 The phone booth and gas station no longer exist, and this appears to be the same area based on the buildings. Even though the structures appear to have been remodeled since the early 80's, the building on the left still has the tiled roof. Ralph's first flight was shot at another Pasadena, CA location. 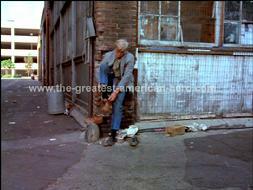 The scene is made up of actual location shooting, mixed with a miniature alley built byMagicam. Here's Ralph's take off point then, and how it appears now. 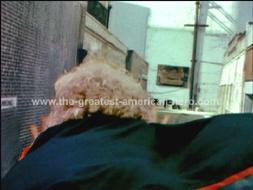 Here's a look then and now of Ralph approaching the billboard. 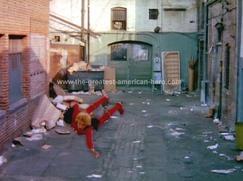 Katt is matted into a shot of Magicam's miniature alley on the left. 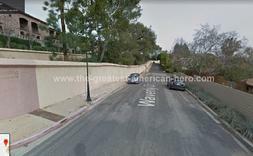 On the right is the real alley as it appears today. The building on Ralph's right replicated here in miniature has now been removed at the real life location. The billboard was just to the left of the pole, and above what is a glass window display today. 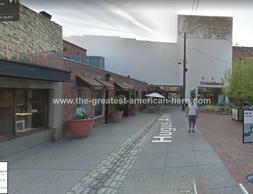 With the building now gone at the real life location where the bum steals Ralph's clothes, I've tried to replicate the approximate spot in the NOW photo. It's skewered a bit because of Google Street View's fisheye lens, and the angles not being the same but I think it does the job to give one the idea of how the real life location was almost 40 years ago. In the future I will have a whole page dedicated to shooting the alley flight. The area of the wall surrounding the fictional Nelson Corey estate hasn't changed much in almost 40 years. The light pole still stands in the same spot, just waiting for Ralph to run by once again and take to the air. 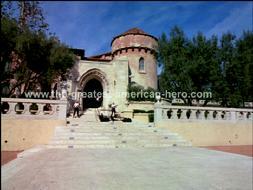 This popular location in Los Angeles has been used over and over in many TV series. Here's the main building at Nelson Corey estate. 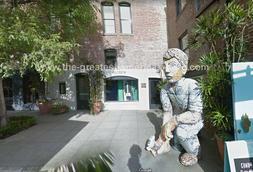 The same location can also be seen again as the Consulate in the 2nd hour long episode called Here's Looking at You, Kid. 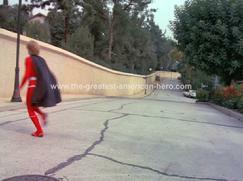 You can also view the same location in various episodes of Airwolf, Knight Rider, and Dynasty to name a few. This is a look at the Los Angeles City Hall, and William S. Hart High School locations. 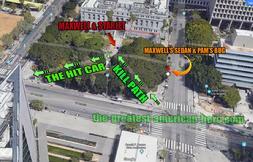 In the city hall location, I show the where the various vehicles are parked, the cast on the steps, and The Hit Car kill path. 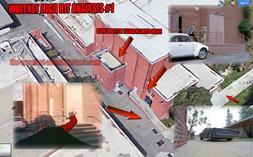 For the high school location, I will be giving visitors an idea of how The Hit Car attack was put together for filming. "The Greatest American Hero," character names and related design © 1981-2019 Stephen J. Cannell Productions. Episode guide and other written content © 2019 The-Greatest-American-Hero.com. This Website is for fan-related purposes only. Do not use any content on this site without the express written permission of the respective owners.